When we are sick, what do we usually do? We see the doctor and take medicine, right? But do you know that in our body, we have a built-in system that helps us handle all these germs that invade our body? That system is called the Immune System. This term Immune System may seem very abstract to some of us - which part of the body is it? What is it exactly? The human immune system is very complicated. It is a precise biochemical system that comprises of different types of immune cells that interact in a cooperative, yet restrictive way to protect the body. Essentially, they are a group of many different immune cells that work closely with each other, like an orchestra, to defend the body. When the system is impaired (or not finely tuned), our immunity will be reduced / lost, allowing foreign bodies to invade and over time, leading to sickness / death. 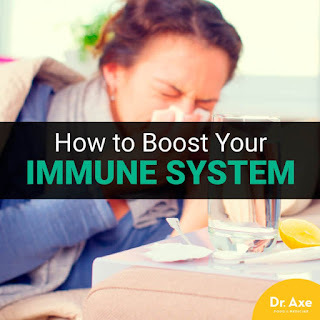 So it is very important that the immune system can work optimally. (a) On the outer side, we have our skin. On the inner side, we also have an inner layer of skin called oral mucosa. There are also the saliva and tears to trap pathogens when they try to invade our body. (b) In the stomach, there is the gastric juice that can kill many types of bacteria and viruses. Front-line defence which are the Phagocytes (external pathogens) and Natural Killer Cells (scans for mutated cells). Second-line defence which are T-cells (Th1 and Th2 - soldiers) and B-cells (produce antibodies). The immune cells are also known as white blood cells (WBC). There are 3,500 to 9,000 WBC in a micro-litre of blood in a healthy person. There are pathogens everywhere; in the air, in the water and when we are in contact with people. These are external pathogens (bacteria, viruses, parasites etc). (a) Under-active immune, when you have less than 3,500 WBC/ml blood. Your immune system is low and your body cannot defend against pathogens. You are weak and prone to sickness. There may be some cells that start to mutate and you won't even realise it. (b) Over-active immune, when you WBC count is more than 9,000. When that happens, your immune cells are over-reacting and attacking the host organs. Your Th1 and Th2 cells not properly regulated. Nowadays, one of the most life threatening diseases comes from virus. Virus is a 'thing' which lies dormant (or "dead") until it encounters a human cell, where it's triggered to become "alive". A virus is a truly host-dependent creature. When it finds a cell, it lives within and starts to regenerate itself by releasing some RNA. The virus mutates easily and very fast due to unstable RNA, which is why vaccination doesn't work. It's mutation speed is always faster than vaccination speed. When virus grow/replicate, it needs an enzyme called neuraminidase. Scientists try to find a medicine that can stop the activity of neuraminidase. If that can be done, then it can stop the virus from growing. The only solution for immunity war caused by virus infection is optimum immune system. That means having sufficient troops and firepower in the shortest time possible. This is because the virus multiply very fast, so we need sufficient immune cells to work on it and produce the antibodies to kill the virus. Lingzhi is categorised as a type of Food that can be used to treat many ailments (behaving like Medicine). In such cases, we need to administer at a sufficient dosage. The person may also need to take for long-term. For that, safety of the product is an important consideration. Lingzhi rests in the over-lapping area between Food and Medicine. It is very safe to be taken at high dose over long-term. There are 2 components in Lingzhi that play an important role in immune modulation - Triterpenoids and Macromolecular Polysaccharide. It is found that Triterpenoids can help stop the activity of neuraminidase enzymes and decrease Th2 cell activity (prevent allergy). Polysaccharides increase Th1 cell activity. However, not all Lingzhi products in the market are the same. You need to choose your products wisely. I recommend Yung Kien Ganoderma. Why? 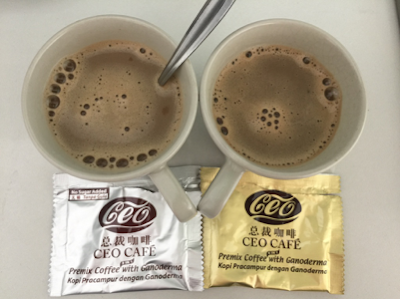 It has accreditation from the Health Ministry of Taiwan for its immune modulation capability, Singapore Health Sciences Authority and Japan Health Food Association. Yung Kien Factory is awarded with ISO 9001 standard and GMP standard. That ensures consistency and quality in the processing of Lingzhi. 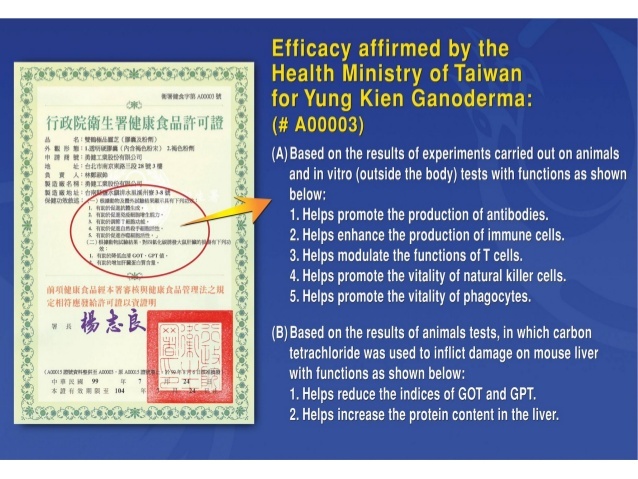 A toxicity test has been done which confirms that Yung Kien Ganoderma can be taken for long-term and it is safe. How Much Lingzhi to Take? It depends on how serious is your "immunity war". As a guide, for serious cases, you can take 5-10 capsules Yung Kien Ganoderma every hour. The reason is you need a constant boost of triterpenoids and polysaccharides in your bloodstream. Is it sufficient to only take Lingzhi? In fact, it is better if you pair it with Yung Kien Pollen. Even though you have some body cells which are under attack, you have many healthy cells from head to toe that need daily nourishment. The result of merely taking Lingzhi and food may not be as good as taking Lingzhi together with Pollen. The reason is this. When we are sick, we usually don't have much appetite. We tend to eat less. But we still need nutrients. If we take something that is natural and wholesome, our body can easily digest and use it. That's why I recommend Yung Kien Pollen, as it contains more than 16 types of vitamins, more than 16 types of minerals, more than 21 types of amino acid, more than 28 types of nucleic acid and more than 96 types of enzymes and coenzymes. All these nutrients help to support the many functions that your body must perform. More importantly, Pollen enhances the efficacy of Lingzhi, making it work better. There is no dosage requirement for taking Yung Kien Pollen. When you are sick, you can take 5-10 capsules every hour. At the same time, it is important to drink sufficient water and have enough rest, to help you recover faster. Otherwise, you stress your immune further. For children who are sick, when they don't have appetite to eat, just feed them Pollen throughout the day. They can still have a lot of energy even though they are not eating a lot of solid food. Your immune system is the Best Doctor in town. Empower it with the right resources for it to do its job, more so in times of immunity war. Lingzhi is a Food that can help to regulate immune system. It is Safe and Multi-functional. If you have been taking Lingzhi for a period of time, you find that you fall sick less and recover faster. When your immune system is well regulated, it will be able to handle pathogens better. Pollen helps to reinforce the efficacy of Lingzhi by supporting the body with the necessary nutrients. Pollen gives your body nutrients with high bio-availability that it can easily use without being burdened with a lot of work like digestion etc. Email me at askfuiping@gmail.com to order Lingzhi to boost up your immune system. I am an Authorised Distributor.